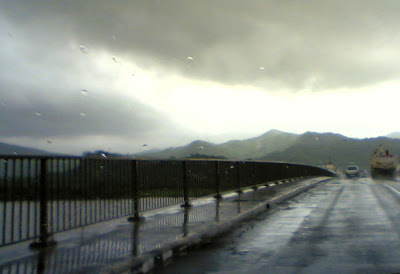 The bridge that connects to its far flung suburbs of Vasai and Virar. 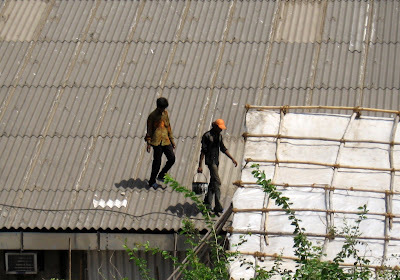 These roof fixers are in great demand just before and during the monsoons to fix leaking roofs. 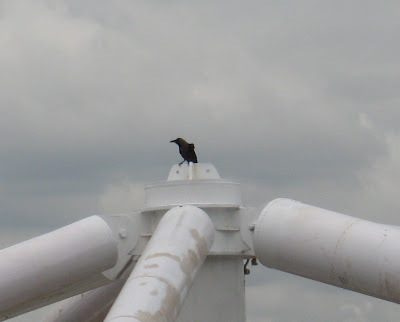 They do it by covering the spots with treated tarpaulin and coating it with tar. It works! 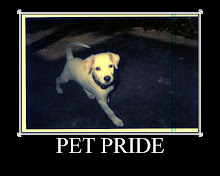 The animal that is a survivor in Mumbai! 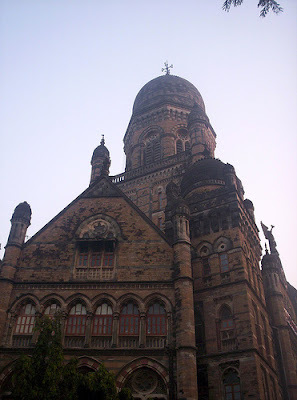 This is the Brihanmumbai Municipal Corporation building in South Mumbai. The architecture is noteworthy. The foundation stone for the offices of the Bombay Municipal Corporation was laid on December 9, 1884, by the Viceroy, Lord Ripon. The Gothic design by F. W. Stevens was selected over the Indo-Saracenic design submitted by R. F. Chisholm. Completed in 1893, the building has a 255 feet tall tower. When in Mumbai take your pick from the man wonderful airlines that operate from here. Pictured here are just three of which GoAir and Kingfisher are domestic operators while Jet Airways operates international routes too. GoAir is a low cost airline that operates from Mumbai. Their tagline is Fly Smart! 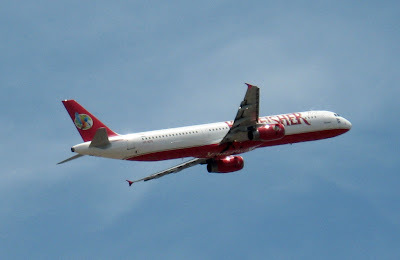 Kingfisher airlines - one of the leading private operators that operate from Mumbai. Presently operates only on domestic routes but will soon start international operations too. 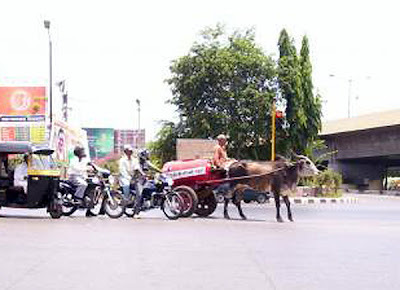 There are some oil companies in Mumbai which still use the traditional bullock cart to transport kerosene from one area to another! 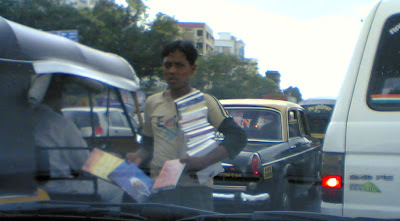 A book seller at the traffic signal. 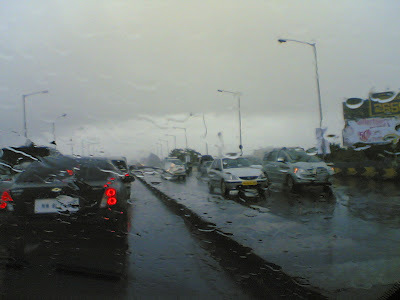 Read your favorite author while you are stuck in the traffic jam! In all probability the book seller is illiterate. Ironic? 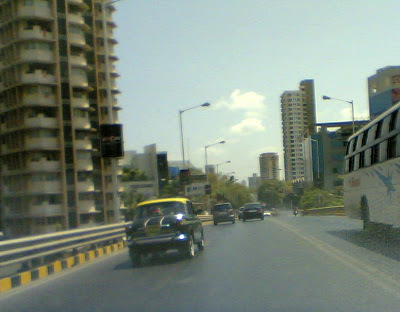 The flyover at 'Lower Parel'. This was the area where the famed textile mills of Mumbai were. Today they are all being razed down making way for malls. Skyscrapers have replaced smoking chimneys. Early build up of traffic with the onset of rain..
Terminal 1-B of the domestic airport in Mumbai undergoing a makeover after privatisation. Water lettuce or Water cabbage as is commonly known is a weed that is also grown in ponds and pots of water at home for ornamentation. the botanical name is Pistia stratiotes. Unfazed by the flooded streets, this boy has come out to take advantage of the situation and play water polo! 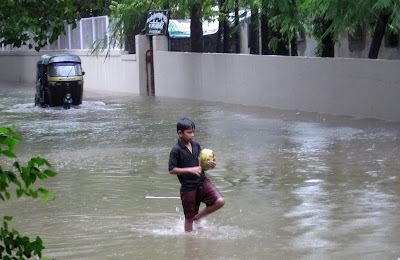 In his hands is a coconut that he found floating in the waters! 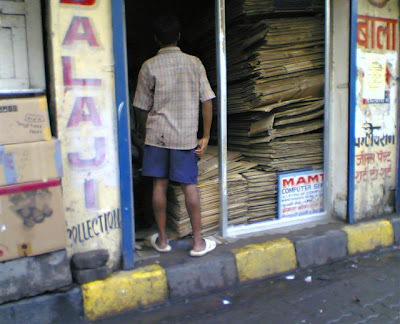 Mumbai is typified by this opportunistic never say die behaviour. The result of the cloud build up..... 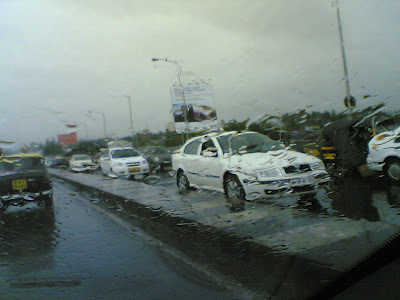 It created havoc in Mumbai..